Armed police stand guard outside Laika and the Bank of Cyprus this morning as the banks prepare to open. But savers' efforts to extract their savings will be in vain. Cyprus is waiting for its banks to open this morning. Cash stocks were replenished overnight to prepare for the influx of savers, desperate to get their cash out. But they are likely to be disappointed. The government has set strict controls to stop a run on the banks. Customers will not be able to withdraw more than €300 a day, there is a blanket ban on cashing cheques, and transfers on debit and credit cards have been limited to €5,000 a month. Tourists beware: in order to stop Cypriots fleeing the country with their life savings, no more than €1,000 can be taken out of the country. Even businesses have been set a daily transaction limit of €5,000 a day – any more than that, and the business owner will have to present their commercial case in front of a new committee and ask for a special dispensation. The stock exchange will remain closed till after Easter. Such capital controls have not been seen in the eurozone since the birth of the single currency. Armed police and hired hands from the security firm G4S stand guard outside the banks to prevent a scrum. John Arghyrou, head of G4S Cyprus, says: ‘We advise our guards to be understanding.’ But so far, those queuing have been 'calm and dignified,' says C4 economics editor Faisal Islam. The new capital control rules are being handed out to the waiting public on scraps of paper by police officers. 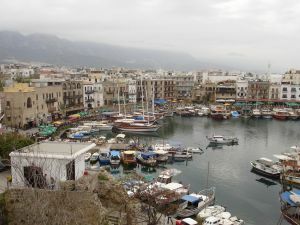 These restrictions on the movement of capital contravene the basic principles of the single currency but the European Commission has responded to complaints about the 1930s-style German bank seizures with a statement saying that the ‘stability of financial markets and the banking system in Cyprus constitutes a matter of overriding public interest’. Indeed, Cyprus will face a whole lot more pain if it fails to raise the requisite €5.8bn that will qualify it for the €10bn bailout from the European Union, European Central Bank and the International Monetary Fund. The ‘troika’ has risen as the central power in the eurozone once more. Each day, money will be slowly leached from savers’ accounts until the minimum amount has been raised. The Central Bank of Cyprus and the government of Cyprus will review the coffers each day, and begin ‘lifting the measures as soon as circumstances allow,’ says a statement from the ministry of finance. The government says that the process could be a matter of weeks but savers are sceptical. And this is the sad truth of Cyprus’ plight: there is no guarantee, even with the bailout money, that Cyprus’ banking system can recover from this economic disaster. Spain and Italy will be watching the developments over the coming weeks very closely indeed.